Yet another war on Encryption! 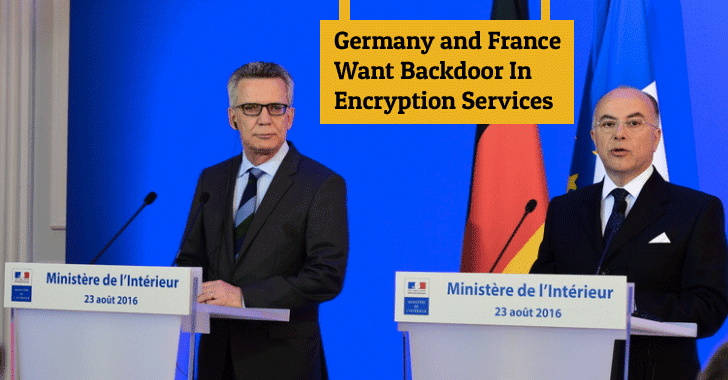 France and Germany are asking the European Union for new laws that would require mobile messaging services to decrypt secure communications on demand and make them available to law enforcement agencies. French and German interior ministers this week said their governments should be able to access content on encrypted services in order to fight terrorism, the Wall Street Journal reported. French interior minister Bernard Cazeneuve went on to say that the encrypted messaging apps like Telegram and WhatsApp "constitute a challenge during investigations," making it difficult for law enforcement to conduct surveillance on suspected terrorists. The proposal calls on the European Commission to draft a law that would "impose obligations on operators who show themselves to be non-cooperative, in particular when it comes to withdrawing illegal content or decrypting messages as part of an investigation." The proposed laws would force major technology companies including Apple, WhatsApp, Facebook, Telegram, and many others, to build encryption backdoors into their messaging apps. The European Union has always been a strong supporter of privacy and encryption, but the recent series of terrorist attacks across both France and Germany this summer, including Normandy church attack carried out by two jihadists who reportedly met on Telegram, which made the countries shout for encryption backdoors loudly. Although the proposal acknowledges encryption to be a critical part in securing communications and financial transactions, it says that solutions must be found to "enable effective investigation" while protecting users’ privacy. Privacy advocates have been alarmed by the new proposals, as recent NSA hack just recently proved all of us that no system is hack-proof for hackers with right hacking skills and sufficient resources. So, what happened to the NSA, which is the highly sophisticated intelligence agency of the world, could happen to encrypted messaging services that would feature an encryption backdoor for law enforcement. The European Commission is believed to come up with new laws on privacy and security for telecom operators this fall, which would include third-party services such as WhatsApp or Telegram.